August is keeping your soil water absorbent, sidedressing, harvesting, plant a last round of summer favorites, start cool-season seedlings, time to preserve your abundance for winter eating, to take stock and make notes for next year’s summer planting! September is exciting because it is the first month to plant fall veggies! Do your final harvesting, preserving, clean up, chop and compost, and plant on Labor Day weekend! October is considered by many to be the best planting month of the year!! Time to take up strawberry daughters (runners) for November planting, clean up to break pest and disease cycles, plant your winter veggies, plant more veggies if you started in September! Plant another round of your summer favs if you want, but keep in mind that Sep/Oct are the best fall planting months, so check those dates to maturity! The sooner you start your winter plants, the faster start they have, the sooner you have winter veggies. Things get slower as it gets cooler, so a head start makes sense. And, heat lovers started now will have a shorter harvest period. Just saying. Watering: Keep your veggies well watered, daily on extra hot days. Seedlings may need water 2 to 3 times a day! Keep strawberries moist or they will stop producing. It tomatoes dry out, they drop their blossoms. Water short rooted plants, beans, lettuces, cukes, more frequently. They like lots of water, steady water! Mulch short rooted plants, beans, cukes, lettuces and strawberries, and deeper rooted chard, to keep them cool and moist. More about summer mulching. Feeding: Get out your fish emulsion, get some manures, and feed your plants! Foliar feed with compost, manure, worm casting tea. Epsom salts your peppers. Seabird guano (NOT bat guano) keeps plants flowering and producing! See about aspirin in my upcoming 8.11.11 post! Harvest like crazy! Be thorough to keep your crop coming, and be gentle to keep your plants undamaged so they aren’t open to pests and diseases. Be specially careful around your trellised or caged cuke’s brittle leaves. You can hear them snap if you push against them too much or accidentally back into them. 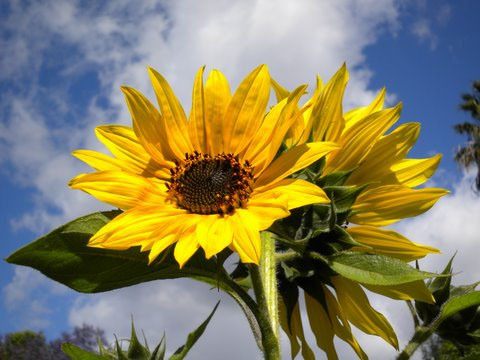 Save seeds from your very best plants! Pests and Diseases: Stay with your prevention programs, and clear away debris, spent or unhealthy plants. Mini tip: Keep a 5 gal bucket, or wheel barrow, near you to collect debris as you work. Start making compost for fall planting. Chop into small pieces for faster decomposition. Set safe spots aside for seedling nurseries. Install gopher wire barriers in your new planting beds, redo an old bed. Incorporate manures, worm castings, and already-made compost into your soil. Top with mulch, maybe straw mixed with nitrogen rich alfalfa, to keep feeding your soil and keep the under layer moist. Get the best varieties of seeds for starts now for Sep/Oct planting, or to put in the ground then! Let strawberry runners grow now. Enjoy your harvests! Preserve or Give Away your bounty! HARVEST, the Return on Your Garden Sweat Equity! 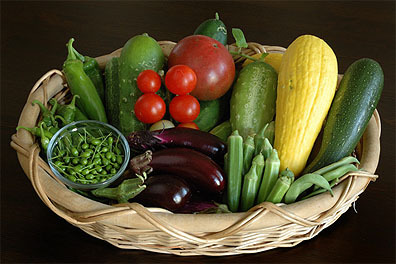 Yummerlicous basket of summer veggies grown near Mahanandi, a peaceful temple town in India. Indira and her Husband Vijay share the traditional recipes of their families. Brinjals, btw, are eggplants! Each of your plants has special harvest needs and techniques to get continuing excellent returns! Be gentle in closely planted areas. Leaf damage opens your plant to diseases and pests. Breaking off new tender shoots stops that point of growth. Harvest when your plants are dry, before you water, to reduce disease spread. Beets Pull when they are small and tender. Steam the leaves too. Broccoli Though thought of as a winter crop, All Season brocs are perkin’ right along, prolific with side shoots! Keep them picked to keep them coming. Get them to the fridge ASAP because they wilt fast. Cantaloupe is ready when it ‘slips’ from the plant – no pulling, it just comes off in your hand. Corn is ripe when the silks turn crispy brown, and the juice is white when you pierce a kernel with your finger nail. Corn pretty much comes in all at once. Get ready to feast, invite friends! Corn turns starchy immediately, so get it to the fridge, or into that boiling water ASAP! Cut the kernels off the cob to sprinkle over salads, freeze for winter stews. Carrots Poke around with your finger to see if the shoulder, the top of the carrot, is the size you want. Loosen the soil with a spade fork if necessary, pull, rinse, eat! I mean take them home to share with your family! If they are hairy and forked, your soil was too rich. If the shoulders are green, they needed to have been covered with soil. Cucumbers! Harvest at will. Your choice, but big ones can be seedy. And if you wait too long, the plant thinks it’s done and stops producing. Harvesting smaller is better. Keep your cucs well watered – they make a watery fruit. Pickle some! Grow dill beside them to be ready for pickling. Eggplant, Aubergine. Shiny. When they are shiny and they don’t spring back when you press them. The more you clip, the more you get. Another no-store-on-the-plant! Green Beans Or any kind of bean! Pick, pick, pick, carefully so as not to damage your plant, to keep them coming! Pick when the leaves are dry, so you don’t spread diseases, and before the pods get bumpy. Lettuces Crisp summer lettuce salads hit the spot! Pick the leaves last, just before you head for the fridge. Keep taking the lower leaves. If your plant starts to bolt (grow upward), take the whole plant right away unless you want it to seed for you, otherwise, it’s compost. Peppers! When they are big and they’ve got that great pepper shape! Peppers have a specific number they reach and they won’t make any more until you pick some! Radish Keep them well watered for fast growth, pull before they split. They are usually a bit hotter in summer. Summer Squash (zucchini, crookneck, etc.) Cut them off at your preference, but when it’s hot, keep a watch under those leaves! Giant squash sap the strength from your plant and keep younger fruit from developing. Harvest small for salad slices. When you find a giant hiding, use it for stuffing and baking. If you are getting too many, pick the blossoms off to slow them down; eat the blossoms! See ALL about SQUASH at On The Green Farms! Tomatoes! Red on the vine, before the bugs, birds or mice get them. Watermelon When the tendrils start to dry and the bottom of the melon turns creamy color. If it makes a dull sound when you thump it, it’s overripe. SEEDS! Seeds are another kind of harvest! Let your best plants flower and seed. Collect those seeds for planting next year! But not the seeds of hybrids or corn unless your corn in no way can hybridize with anyone else’s corn! Preserve! If you have a great abundance, start preserving! Dry, freeze, can! Share! Have extra tomatoes, beans, cukes, zuchs, and you don’t have time or inclination to preserve?! Share your abundance! Here’s how! Give to Pilgrim Terrace residents! Take your veggies to the office 8 AM to 5 PM (Modoc/Portesuello). They watch the garden for us, so it’s good payback! The elders really appreciate fresh veggies and herbs! Santa Barbara County’s Foodbank Drop off M-F 7 AM – 3:30 PM at 4554 Hollister Av. Thanks for your generosity when so many really need your kindness. Just a quick stop among your errands…. Organic garden-fresh produce can’t be beat! Enjoy every life-giving luscious bite! Next week: August in Your Garden! July, August, September and October Garden Timing! 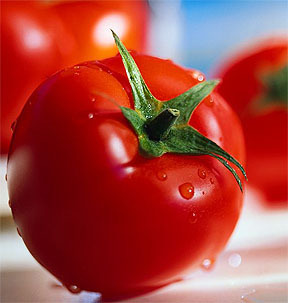 Tomato-Hot Juicy July! July is not so much a planting month as water, sidedressing, harvest, and making compost – soil prep for September & October fall plantings! Get seeds! Plant another round of your summer favs if you want, but keep in mind that Sep/Oct are the best fall planting months, so check those dates to maturity! 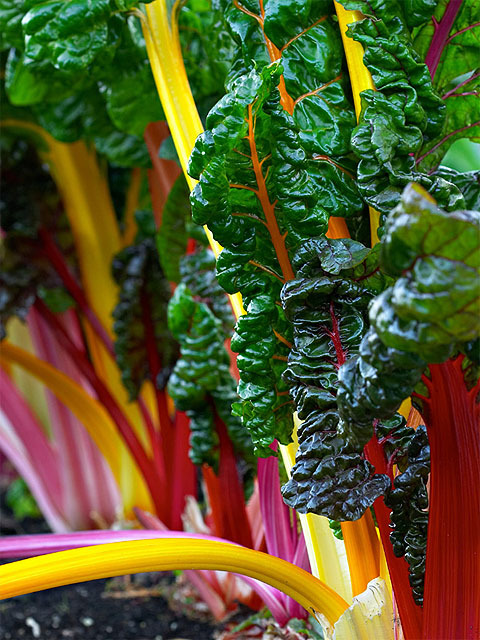 The sooner you start your winter plants, the faster start they have, the sooner you have winter veggies. Things get slower as it gets cooler. And, heat lovers started now will have a shorter harvest period. Just saying. Watering Keep your veggies well watered, daily on extra hot days. Seedlings may need water 2 to 3 times a day! Keep strawberries moist or they will stop producing. It tomatoes dry out, they drop their blossoms. Water short rooted plants, beans, lettuces, cukes, more frequently. They like lots of water! Mulch short rooted plants, beans, lettuces and strawberries, and deeper rooted chard, to keep them cool and moist. More about summer mulching. Feeding Get out your fish emulsion, get some manures, and feed your plants! Foliar feed with compost, manure, worm casting tea. Epsom salts your peppers. Seabird guano (NOT bat guano) keeps plants flowering and producing! Blood meal is a quick Nitrogen fix for yellowing leaves. Prep your fall raised beds! Start making compost for fall planting. Chop into small pieces for faster decomposition. Install gopher wire barriers in your new beds. Incorporate manures and already-made compost into your soil. Get the best varieties of seeds for Sep/Oct planting! Harvest! Do keep up so your plants keep producing. What you can’t eat or preserve, give away! It will be so appreciated! This article is by Robyn Francis, one of Australia’s top permaculturists. She’s also a pioneer in rethinking international aid. Next week, Composting Made EASY! Love, Flowers, Healing – Happy Wesak! In honor of Wesak, the May Taurus/Scorpio Full Moon, of Love and Wisdom, the Buddha, I share this story with you for your contemplation…. It is said that people in Tibet seek healing from physical and emotional wounds in a unique way. They sit downwind from flowers. It is a therapy that has been carried on for centuries, based not on superstition but on natural medicine. Sitting downwind from flowers, one can be dusted with the pollen from new blossoms, pollen that some say carries certain healing qualities. Linda Ross Swanson tells the story of a 52-year-old Tibetan refugee named Tenzin who lived in Seattle. Diagnosed with lymphoma and unwilling to undergo the usual chemotherapy treatment because it brought back memories of having been tortured as a political prisoner in China, he was brought to a hospice. There he told workers of the Tibetan method of healing, and one of them agreed to help. On a sunny afternoon the hospice worker picked up Tenzin and his wife, packed some provisions traditional to Tibetans—black tea, yak butter, salt, cups and cookies—and dropped the couple off at a nursery. They found a suitable spot, sat downwind from the flowers and, under the watchful eye of curious nursery employees, enjoyed their afternoon tea. They did the same the following week at another nursery. The word got around, and soon nurseries all over Seattle were vying for Tenzin’s presence. They called him when new plants arrived, placed chairs to match the wind direction and provided the tea. Customers filled flats with flowers and put them carefully around the couple, and some began calling nurseries to ask how he was doing. Day after day throughout an entire summer Tenzin and his wife sat downwind from flowers around Seattle. I share this story not to promote folk medicine but because I believe love cures people—those who receive it and those who give it. Love is life’s healing agent. When searching for a way to heal—if not cancer, then at least a wounded heart—sit downwind from flowers. Allow people to touch you with their goodness and kindness. Allow them to be touched by yours. There is healing there. You have just read “Downwind from Flowers,” written by Dr. Michael Halleen and re-printed here with his permission. It was published as Monday Moments on April 7, 2008. His book, You Are Rich, is a collection of sixty Monday Moments and is available for sale at $12 each. Contact Dr. Halleen at mhalleen@att.net for more information.